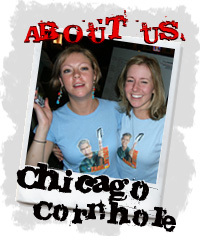 ChicagoCornhole has been the premier offering of Backyard Players, LLC for the past four and a half years. In that time, the game has grown from one league of 14 teams to multiple leagues filled to capacity with 40 teams in each! If you have general questions about the game, feel free to cruise around our site a bit to learn more! And if you still have questions about the game, or about ChicagoCornhole leagues, please feel free to e-mail us at info@backyardplayers.com. We'll get back to you as soon as possible!